Why is that? Why do we latch on to stories and statistics on the price of education that confirm a belief that might not be true? Part of the reason is that the story of rising tuition is a convenient narrative: college is expensive and it's just getting pricier, so that's probably the reason you (or your children) will have five figures of student loan debt. You are not to blame: it's those greedy crooks at the university. Never mind that half of parents are not saving anything for their children's education, and as a group we are saving at a lower rate for college in 2014 than we were in 2010. Of course, things are hard now a days, with the economy and all. On top of the university administration, we can also point at the recession. (Of course, the economy is generally better in 2014 than it was in 2010.) But no one ever says, "I would rather have cable television than put $100 a month into my child's college fund." Because, well, that's really terrible and depressing. So we tell ourselves something else. Something better. These convenient narratives are part of our day-to-day routines. It would be too difficult to get through certain tough situations without them. If my job is soul-crushing but I have no better alternative right now, or I'm in a dead-end relationship but breaking up might be messy and protracted, the reality of my circumstances might be too much to deal with all at once. So I'll tell myself things really aren't so bad, and put a good face on it. Because while I might not be able to remedy the problem today, I still need to get through today. But there are downsides to this sort of mental storytelling. For instance, I don't like admitting that I'm gaining weight as I get older. I can't keep eating and exercising like I'm 24 when I'm actually 34. It's a hard reality to face, this whole stupid aging thing. 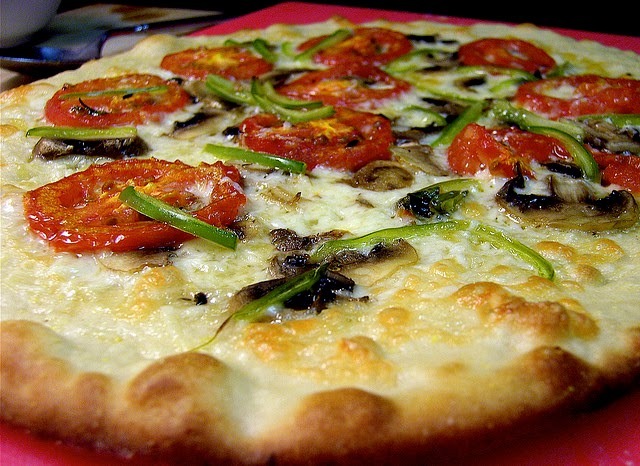 Still, I find that when I want buy a pizza after a tough day at work, I'll tell myself that I'm just outsourcing a low-value task (like Tim Ferriss!) and getting a good deal, to boot. Think of all those easy to re-heat leftovers, and the time I'll save in preparing lunches. Plus, I worked hard today, and I can afford to get takeout from time to time. Fast forward a bit, and I'm eating pizza every lunch for a week, and ensuring I'll weigh just a little more when I work up the courage to step on the scale again. When the pizza is gone, another tough day at work comes along like clockwork, and wouldn't it be easier just to order some takeout tonight? Lather, rinse, repeat. One pizza won't derail your goals. Especially since you're going to hit the gym really hard later in the week, once work slows down. Besides, do you really want to chop up all those veggies and grill a chicken breast? The chicken's still frozen, and it'd be tastier if you marinated it anyway. Just get the pizza today, start to defrost the chicken, and then tomorrow, we'll have the chicken and a really big salad. Honest. The narrative is the velvet handcuff that keeps me chained to my bad eating habit. Of course, I know on some level that I'm just lying to myself. So does the consumer who engages in retail therapy, putting more on his credit card than he can pay off at the end of the month. So does the parent who manages to have a fancy data plan for his cell phone and can swing a monthly payment for a new-ish Honda, but can't seem to find a hundred bucks a month for Junior's college fund. He knows the savings for college is the bigger priority, just like I know a healthy diet is important for my overall health. But change is elusive. In each case, the convenient narrative tells us that, yes, we understand. Yes, we'll make the hard choices, the right choices. We'll better ourselves and do the right thing. Change will come...just not right now. Later. Tomorrow, even. 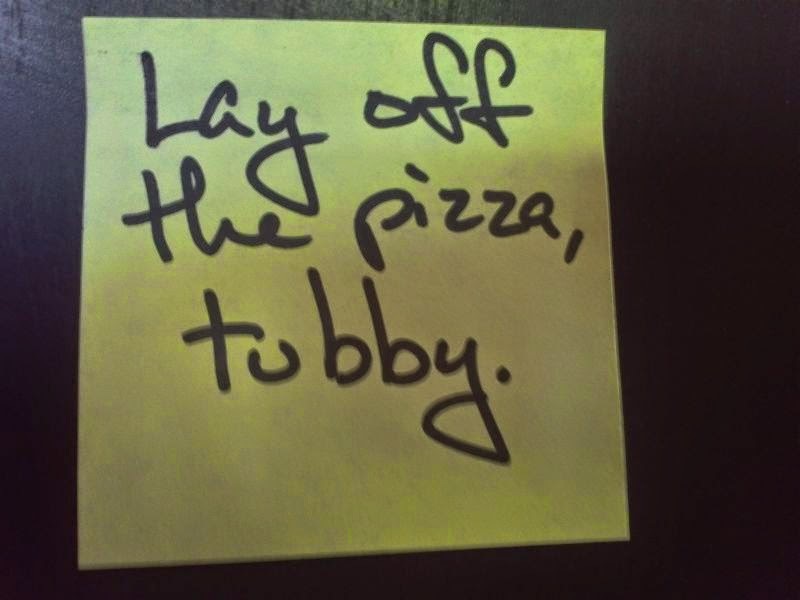 Putting these notes in strategic places, like near your computer if you always order pizza online, is a good tactic. Just be sure to tell your significant other that the note is in no way directed at her, because she's clearly very thin, and beautiful, and yes, attractive, of course. A better plan might be to simply write down the self-defeating narratives we tell ourselves. There is something powerful about the written word. Our thoughts can be manipulative and convincing in the moment they are first conceived in our noggins, especially in a weak moment. But on paper, we can come back and evaluate them when we're more level headed...and less hungry. *Photo is from rdpeyton at Flickr Creative Commons. I love this post DB40. It's pretty phenomenal the way we're influenced by these narratives, sometimes without even realising it. I'm a pretty average story-teller, but I really shine when it comes to these self-defeating narratives! Just like your pizza example - I'll convince myself to do something like a no-caffeine month, but the next day I think 'who was that stupid version of you that said don't drink a coffee! What was he thinking? Luckily I'M back in charge now, so you can just go enjoy your coffee, and all is right with the world again!'. Sometimes it's hard to figure out who the 'real me' is in each of those conversations. Thanks for the kind comment, Jason! I'm the same way with coffee. I know I should cut down (after all, it's 9:00 pm and I'm drinking a cup), but my internal dialogue shuts down any objections pretty quick. Well said. It's always easier to blame external factors and ignore the fact that often, we just need to change our own behavior. I think your diet/finance analogy works well because both are about developing habits that define your life. Not about vacillating between extremes. And yes, it is easier to believe those soundbite narratives! Thanks for sharing this. Well put, Mrs. Frugalwoods. Behavior change really is the tough medicine: we are the problem, and we are the solution, too. Another rockin' post, my friend. Way to tell it like it is. How much better would life be if we stopped using those convenient narratives as excuses for non-action? Aw, thank you, Laurie! Not only would our personal lives be better if we avoided these excuses, but our communities would benefit as well. I have narratives about food but in the opposite way. I like some expensive things that I don't really "need" to have a healthy diet, but somehow convince myself I do…and of course that affects my budget in a negative way. It does seem the best way to break at least a bad habit, is form another habit, but a good one. Very true, Tonya. I remember reading in The Power of Habit that we really can't break habits, but only replace them. Ha! Yes it does. Thanks for the inspiration and name for my pizza loving Id. Love the monkey brain concept! It explains so much about human behaviour doesn't it? At least you/we know that these narratives and biases exist and can try to spot and catch ourselves out. Guessing a large majority of people have no idea and just get on with making up stories to justify their suboptimal actions! As always knowledge is power, as always great post! "Put off for tomorrow what you can start today" is a common adage I fall into as well. Some say delay tactics help in areas where you are weak or waiver. That is easier to apply when you are trying to stop doing something but more difficult when you are trying to DO something - exercise, clean, paperwork. I love that insight, debt debs. It's a completely different set of tactics for when we're trying to avoid behavior than when we're trying to create it. Oy - the old personal change bugaboo. CatMan used to be a therapist, and he has a saying about this sort of thing: "Trying is Lying." The basic idea being that ultimately, people do what they want to do, and no amount of convincing, cajoling, bribing, rationalizing, or willpower can overcome that basic human tendency. The thing with self-destructive behavior is generally that no matter how much we know that A would be better for us than B - the rewards we're getting from B are obviously more powerful and important than whatever it is that A might have to offer - even when we think otherwise. That isn't to say that people can never change their behavior, but often when people are having trouble with a change that they supposedly want to make, it's because the rewards they're getting from their current behavior are not things they're willing to accept or take ownership of. Usually for me the destructive behavior allows me to express some emotion that I don't want to actually deal with, or act out some "issue" from my past. I've found that once I'm able to uncover that stuff and deal with the real issues beneath it - change comes remarkably easily and quickly. "Trying is Lying" -- that's a fantastic phrase, and probably a good topic for a future post. I love how candid your comment is. The reality is that we're not often ready to make any changes. We might not want to admit it, but we like the rewards from the bad stuff more than we like the "good" behavior. I am such a procrastinator when it comes to some things, and I definitely fall into the trap of telling myself I can make up for it later. I'm still working on how to combat it, but jumping in usually helps. Or I ask my boyfriend to monitor my habits and call me out on it. He's a lot better at taking action than I am! I've found that while I *know* I'll be in a better position once I make the change, I'm still lacking motivation somewhere. Taking small steps can help. I'm glad to know I'm not alone on this, Erin. I like the idea of just taking action: just do it was a phrase that's worked well for me in the past. I've since gone away from it, but often the best thing to stop procrastination is simple, direct action. Cheers! Savings is definitely something people procrastinate about, Dan, I agree. It seems there are so many things we know are good for us, but we have bad habits to overcome regarding them. In all seriousness, excuses are part of human nature, right? I mean, people will do what they want. But by noticing these narratives and wrangling them a bit, you can kind of control the outcome. At least, that's how it should be. Of course, pesky human nature comes into play for the majority of people. I think a big difference between successful people and not-so-successful people is simply that successful people recognize convenient narratives and have the willpower to overcome their own weaknesses. Very few people can control their own destiny in such a way, but those that can usually end up very successful. Changing ourselves and our habits is so hard. I think we're fairly narcissist beings, making it so much easier to blame external factors rather than realizing that we're the ones who need to change, and then actually acting upon that realization. Truth! I'm totally a narcissist (a fact my wife points out from time to time). I don't want to admit that I am the problem...and the solution. Ha! Ironically, I think part of my problem is that the carbs are in sight. I need to hide the carby goodness. At 34 I was still pretty rock solid. All the way until mid 40s. But it does get harder as you get older. and it's even worse, you have more money, so buying that extra treat is not a financial issue, ever. That is HILARIOUS. I am totally going to steal that doughnut joke.